Have you ever been in mid-conversation with a group of women and one says, "Oh, I've never had many female friends..."? Most times a few other ladies in the group would agree with her. But then there are some whose mouth drops open in surprise! How can you be a woman without women friends? Oh, wait... I was once THAT girl! The journey to welcoming a new positive tribe of women into my life was once annoying and super uncomfortable! I thought that in order to prove how "womanly" I was, I had to get into a 'clique' and behave like a schoolgirl character out of the teen movie, "Mean Girls." The groups of women I came into contact with on a regular basis thrived off gossip and took pleasure in always having 'one up' on the next beauty. I could see that the women I encountered were fighting an internal struggle to fulfill the needs of being accepted and acknowledged by others. I didn't steer clear of them, but I sure didn't join the gang! As women, we are natural nurturers, the ability to encourage, embrace, and empower others is embedded within our DNA. On the other hand, we women also have the innate will to compete, to go "hard", and to win (a few of us don't mind stepping on a few manly toes to make it)! Women have the gift of taking the stones that are thrown at them and using them to build mansions and places. Women have the ability to see past where others are to help them go where they need to be. Women have the intuition to feel the needs of others before the need is spoken. Woman have skills that come in handy in many arenas, including the home and the workplace. Women are the ultimate multi-taskers (we can make a full 5 course meal, help the children with homework, create a 6-figure business, and still have time to make great things happen in our romantic relationships). Beyonce wasn't lying when she said "Who Runs the World?... GIRLS!" In the past few years, I have been privileged to be connected to multiple groups of women who exist simply for the betterment of women all over the world! It didn't come easy. Prior to 2012, having a circle of girlfriends seemed foreign to me! I had a tough time trusting that women could get along without hidden motives... sheesh, was I wrong! The ladies are out and about making things happen -- from the home to the business world! I now have best-selling authors, successful life and business coaches, prolific motivational speakers, educators, and engineer friends and guess what... they are WOMEN! I believe there are a few bold and bodacious ladies still left in the world to know the saying to be true, "there is power in numbers"! Something absolutely amazing happens when a group of women come together to lift up and not let down; to listen and support; to motivate and inspire; and to collaborate and not compete. Do not allow what you see on reality television and in the media to make you believe that women 'just can't get along'. You have to get outside of yourself (yes, the self that wants to stay to yourself) and your comfort zone to reach out and make connections with women who have a passion for seeing other women succeed. There is a magic that gets released into the atmosphere (even if it is pink and sparkly) when women work... together! 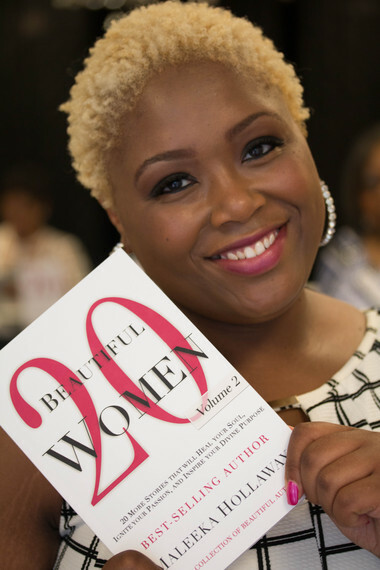 Maleeka T. Hollaway is a best-selling author, life success advocate, business strategist, and a lover of knowledge and people. She is becoming one of the most influential and inspirational women for this generation of millennials.